Why Is Organic Chemistry So Important To Medical School Admissions Committees? Do you need to know Organic Chemistry to be a great doctor? No. But Medical School Admissions Committees sure do think so. It is well known that Medical Schools look closely at your Orgo grades from college when they consider you for admissions to their school. This is true. Let us explain. Medical Schools like to see that an undergraduate student has excelled in Organic Chemistry. Some say it is because Organic Chemistry is a difficult subject and can help differentiate among those students who are stronger than others. Others say it is highly applicable to a typical medical school curriculum and thus those who have excelled in organic chemistry as an undergraduate are more likely to excel as a medical student. The bottom line is that for whatever reason, Organic Chemistry courses seem to produce a greater distribution of grades than do other pre-med courses such as Biology or General Chemistry. Therefore Medical School committees can use this to their advantage and thus can “weed” out weaker students. Are those students truly weak? Probably not. However when admissions committees need to review thousands of applications and can only accept a hundred or so students, they look for any possible way to dwindle down their heaping piles of applications. 4) Good subject score on the MCAT Biologic Sciences demonstrates excellence in Organic Chemistry. 2) If possible, try to have a lighter course-load during the semesters that you take Organic Chemistry. 3) Scope out which professors teach the course you are looking to take depending on the time of the year. Some professors are “known” to be “easier” than others. Should it help to take Orgo I in the Spring and Orgo II in the fall, do so. 4) Obtain your resources early. 5) Develop a study plan and stay ahead of everyone else. 6) If you see that you are having trouble, try to identify so as early as possible. 7) Try to figure out what you professor places an emphasis on. That is what is more likely to be tested on your exams. 8) Ask your professor for old exams to get practice. We here at StudyOrgo.com are aware of this. Therefore we have designed out study tools to combat the typical traps that students fall into. In addition, we highlight the common subjects that students have trouble with so as to separate you from all the rest of the class and get an edge on the competition. So what are you waiting for? 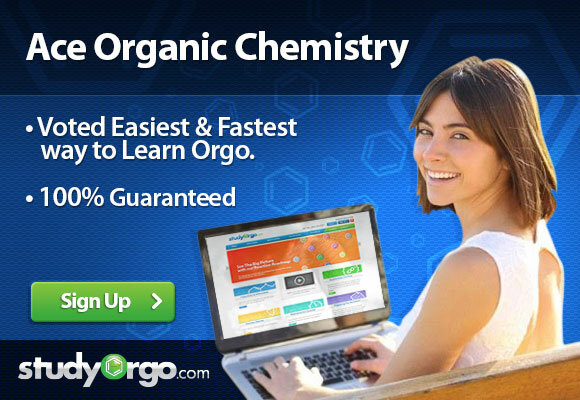 Sign-Up and begin acing Organic Chemistry today!